Harim Co., South Korea’s leading livestock and animal feed company, is seeking to introduce its processed meat products in Europe and Canada after its products have been received well in other overseas markets thanks to the global spread of Korean pop culture. Harim said Thursday that a team of hygiene and quarantine experts from the European Union and Canada visited its chicken farms and poultry meat production facilities in Iksan and Jeongeup, North Jolla Province and conducted due diligence for importing its processed meat products. The company is aiming to export ready-made samgyetang products to Europe and Canada within this year. Samgyetang is Korea’s traditional chicken soup dish made with a whole chicken, ginseng and other herbs that has been gaining popularity outside the nation as interest in Korean food has rapidly grown along with the country’s growing cultural influence across the globe led by Hallyu, Korean Wave. 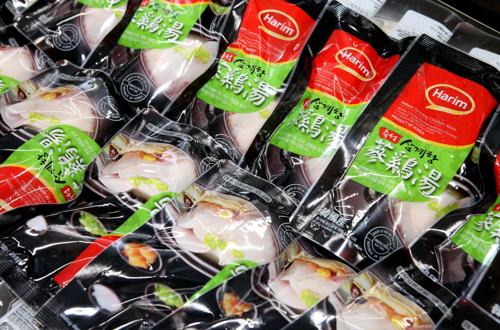 Harim began exporting processed chicken meat products in 1995 and now, its products are shipped out to seven countries including Japan, China, and the United States. Outbound shipments of ready-made samgyetang are growing fast, with its exports reaching 424 tons last year, sharply up from 142 tons in 2014. It already has exported 252 tons of samgyetang products during the first half of this year. The company is also preparing to make inroads into Russia, Mongolia, and Taiwan with its processed meat products.